This demo interfaces with the Lucene search engine and includes basic information on setting up a search engine, inspecting the results, and querying. Spelling correction takes a user input text and provides a "corrected" form. Typically, this is a search engine request, and we address that case first in this tutorial. LingPipe's spelling corrector is also general enough to carry out correction tasks such as restoring case to single-case text, restoring spaces to texts without space, removing automatically inserted hyphenation, replacing ligatures messed up through PDF conversion, etc. We turn to the more general cases in the second half of this tutorial. Auto-completion is an alternative kind of spell checking that tries to find the best completion for a user-entered prefix, allowing spell checking to happen in matching the completion. 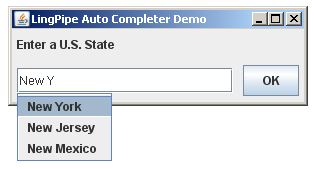 See the section Auto-Completion for a demo. LingPipe's spelling correction is based on a noisy-channel model, which models user mistakes (typos and brainos) and expected user input (based on the data). Mistakes are modeled by weighted edit distances and expected input by a character language model. The noisy-channel model was invented by Claude Shannon of Bell Laboratories in the 1940s. The original motivation was transmitting signals over noisy telephone lines. The original reference is cited below. Spelling correction is a widely used application of the noisy channel model. The search engines return approximate numbers of hits. They won't let you retrieve that many results. For hits with small "about" numbers, the actual number of results may be much lower or higher than approximated. The corrected query has "about" 385,000 hits. Their interface subtly highlights the token that changed by underlining; in this case, the token "brec" is corrected to "breck". Styled as a link (blue and underlined), the user may directly click on the correction to perform a search. 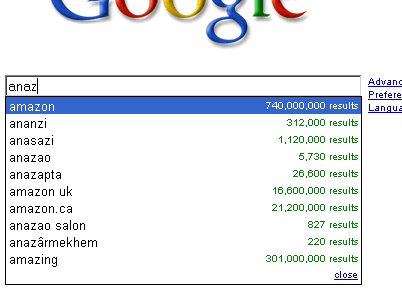 The corrected search has "about" 4,080,000 hits. LingPipe may actually be tuned to simulate either of these first-best suggestions. It's interesting to note that Yahoo doesn't provide the additional GUI focus of double-underlining on the corrected element. It's also interesting to note that they serve ads based on the corrected query. The web is a moving target and search providers are constantly tuning their system's behaviors. The responses provided here were from tests performed on 27 January 2006. MSN's "Were you looking for"
Clicking on that link takes you to an MSN local page. Many other queries produced the same spelling correction as Google, Yahoo and Amazon. Amazon's A9's "Did you mean"
produces the same output as Google's, only with the same single underlining as Yahoo. the additional underlining of the corrected term. indicates there are no matches for the query and asks if we meant "300gb drive", while also somewhat confusingly showing results matching the corrected query. suggests a dozen alternatives, none of which appear helpful for finding that 300gb drive. Even a closely related query like 401gb drive yields very different corrections from all of the major search engines. So do other configurations, because all of these terms are distributed differently in the data. The basic technology works as follows: The documents that the search engine is providing access to are added both to the search index and a language model. The language model stores seen phrases and maintains statistics about them. When a query is submitted, the src/QuerySpellCheck.java class looks for possible character edits, namely substitutions, insertions, replacements, transpositions, and deletions, that make the query a better fit for the lanaguage model. So if you type 'Gretski' as a query, and the underlying data is data from rec.sport.hockey, the language model will be much more familliar with the mildly edited 'Gretzky' and suggests it as an alternative. The big advantage of this approach over dictionary-based spell checking is that the corrections are motivated by data in the search index. So "trt" will be corrected to "tort" in a legal domain, "tart" in a cooking domain, and "TRt" in a bio-informatics domain. On Google, there is no suggested correction, presumably because of web domains "trt.com", Thessaly Radio Television as well as Turkiye Radyo Televizyon, both aka TRT, etc. Both Yahoo and Google perform context-sensitive correction. For instance, the query frod (an Old English term from the German meaning wise or experienced) has a suggested correction of ford (the automotive company, among others), whereas the query frod baggins has the corrected query frodo baggins (a 20th century English fictional character). That's the Yahoo behavior. Google doesn't correct frod baggins, even though there are about 785 hits for it versus 820,000 for Frodo Baggins. On the other hand, Google does correct frdo and frdo baggins. Amazon behaves similarly, but MSN corrects frd baggins to ford baggins rather than frodo baggins. LingPipe's model supports exactly this kind of context-sensitive correction. Depending on how you received your LingPipe distribution (web, tarball, CD), and whether or not you've done top-level LingPipe cleans, you may need to unpack some of the demo data. Use just <RETURN>b to exit. Pretty obviously the query spell checker is increasing the size of the returned results by fitting the queries better to the indexed data. This won't necessarily always do the right thing, but it allows for some fuzziness in getting spelling right which addresses a long standing problem with search engines. One difference between the spell checker in LingPipe and many other common spell checkers is that it is able to split tokens, as in the query "StanleyCup" as well as combine tokens, as seen for the query "Stan ley Cup". Note that this is a pretty trivial amount of data and we're only training with character 5-grams. To compensate, we have set the edit costs very low, but the result of this is overly eager correction. Typical spelling checking applications rely on orders of magnitude differences in occurrences, with edit distances set around the -8 to -10 level, requiring the correction to be 250 to 1000 times more likely than the edit in the training data. With Stanley Cup only occurring 143 times, we have to fudge the typical settings a bit for demo purposes. Also note that we have not been at all careful in catching the many types of errors thrown by Lucene's rather fastidious query parser. So if you enter a query like "((]-<", you will receive a query parser exception for your troubles. The QuerySpellCheck.java class brings together quite a few components as well as the Lucene search engine. process queries from the command line. Working from top to bottom, we start by creating a FixedWeightEditDistance object which sets the weights for operations like deletions, insertions etc. Reasonable values have been supplied in the demo but they can be played with to help with variations due to particular data sets. There is a lot of room for messing around with this class but that is beyond the scope of this tutorial. The next step is to create a NGramProcessLM which will be doing the language modeling at the character level for our demo. All it needs to know is the number of characters to sample in its modeling of the data. Smaller data sets will do better with lower number of characters. Once again, this is something you can play with to evaluate the quality of your queries and the suggested corrections. In addition we need a TokenizerFactory to help with the editing of queries--this tokenizer should ideally match the tokenizer being used by the Lucene, which must be an implementation of org.apache.lucene.analysis.Analyzer--see below. It all comes together with the TrainSpellChecker class which will do the training sensitive to tokenization. Lucene builds the search index with the IndexWriter class which takes a directory to write the index to, an analyzer to tokenize the data and a boolean flag controlling whether a new index is created or the index is to be added to. In this case we have chosen to set a static variable ANALYZER to an instance of Lucene's StandardAnalyzer, which applies some standard filters to the data and converts it to lowercase. The last argument limits the maximum size of a field, with a default well above the size of documents we're dealing with. Adding the data is very simple, all we need do is iterate over the documents and send them off to the respective methods for language model training and index addition. System.out.println("Writing lucene index to ="
adapt the LingPipe tokenizer factory to implement a Lucene Analyzer. Once we have the string for the file, training the language model is a one liner sc.handle(charSequence);. Getting the data into Lucene is a bit more work because it is structuring the data in a more complex way in support of all those nice search engine features. We are creating a new Document object, adding the data under a field name (which we will need when querying) and finally adding the document to the index. Now we illustrate writing the spell checker and Lucene index to disk, where they can be read back in by an application. Lucene wraps closing and writing the index to disk nicely and there is a single method call luceneIndexWriter.close() that does all the work. Writing out the spell checker is a bit more work and the steps are in the demo writeModel method. Once the model and index are written to disk, we can read them in and correct queries. The readModel method (not shown) shows how to combine the relevant Java I/O to de-serialize the class. We have changed class though to a CompiledSpellChecker which is required for generating corrections; the main reason for this is that compiled language models are much faster in execution than their non-compiled versions. Loading the Lucene similarly changes the core class to being IndexSearcher and we are ready to start correcting queries. The last line of the above code calls the interactive command line loop. An actual deployment of a search engine requires much more than what the demo presents--in particular some sort of access to documents. But hopefully the below shows enough to show how to get spell checking up and running within whatever fuller featured deployment you have in mind. The method below has an endless while loop reading from the command prompt. The flow is to get the query, run it against Lucene and report the counts. Then look for an alternate query and run that against the Lucene index and again report the results. + " document(s) that matched query '"
+ " document(s) matched best alternate '"
Looking more closely at the code, other than messing about with I/O and killing the loop when an empty line is entered, there are just a few key methods. First we use the Lucene QueryParser class to produce a Query. This takes parameters including the query string its self, then the field in in the Lucene index to be searched, here TEXT_FIELD again (we only have one, but you could imagine a much more complex setup with title, author etc. ), and finally an analyzer which will be used to tokenize the query, here LUCENE_TOKENIZER again. It is generally wise to use the same analyzer for indexing and for parsing queries. Use Luke to explore a Lucene index. It'll help you see how documents are tokenized, how they were broken into fields, which fields are stored, and how queries are parsed. It will even run a search. Then use the tabs to explore various aspects of the index. Next we collect the documents that match the query with Hits hits = luceneIndex.search(origQuery);. That's all we need from Lucene to report the number of documents --- the Hits class also provides methods for iterating over the found documents in order of matching score. Finally we get to the whole reason for this tutorial with String bestAlternative = sc.didYouMean(query); which takes a look at the language model we built along with the text of the query at hand, and attempts to find a 'better match' with simple edits of the query against the language model. If it doesn't find any better scoring variations on the query, it returns the original back as the best choice. Then the demo runs the returned query and reports on the search results. A deployed query spell checker will need to be quite a bit fancier than this demo but this should make it clear how to add the capabilty to whatever your vision is. Tuning these models can be a bit complex, and the size of the underlying data can be an issue as well. Ideally, you will have an evaluation set of queries, both good and bad randomly generated by actually users that you can use to select appropriate paramaters. In this section, we'll explore the effects of various model components on sizing and run time. Sizing will vary among the training component, the on-disk compiled model and the in-memory representation used by the compiled spell checker. Training efficiency is simple, but run-time efficiency is a more complex issue. Although we do not include code for this case, a spell checker may be trained on a dictionary as well as on source data or query log data. All that is required is to feed the dictionary entries into the trainer just like any other data. It may be worthwhile to boost the dictionary by training each word in the dictionary more than once. Depending on the count of the dictionary, it may dominate or be dominated by the source training data. Many of the efficiency issues are determined by the set of prefixes of tokens in the training set. For instance, the word "Corpus" has prefixes "", "C", "Co", "Cor", "Corp", "Corpu", "Corpus". The word "Corn" has five prefixes, the first four of which are shared with "Corpus". If we train using strings "Corn" and "Corpus", the prefix "Cor" may be followed by either the character 'n' or the character 'p'. The number of characters that may follow a prefix is called the branching factor of the prefix. The main component of a spelling model is a character language model which models the training text. The size required for a character language model is proportional to the number of unique substrings found in the training set. These are not token sensitive, but are bounded in length by the length of n-gram used in the language models. During training, a dynamic character language model is trained with all of the data provided. This is represented as a reasonably compact in-memory trie structure. The only factor affecting speed and size is the length of the n-gram in the character language model. Longer n-grams require more space and take more time to train. The language model itself is available through the method TrainSpellChecker.lm(), though pruning may be carried out through the method TrainSpellChecker.pruneLM(int). This pruning will affect the in-memory representation and the compiled model. It is an irreversible operation. Pruning periodically to a low count threshold such as 2 may allow much more data to be trained than would be possible in an unpruned model. Because language data follows a power-law (Zipf) distribution, most of the sequences stored have counts of 1. It is usually better to train a large model and prune it than train the largest possible unpruned model. Pruning may or may not hurt accuracy with respect to an unpruned model; at a very low pruning threshold, such as 2, there is relatively little impact on accuracy of probability estimates. Additional memory is required for the compiler to perform a breadth-first walk over the langauge model's trie. Usually, this isn't a very large overhead, but it'll be larger in languages with large branching factors. When a language model is compiled, the bytes output correspond to parallel arrays representing the trie that are the same size as in memory. The compiled model will usually be a bit more compact than the in-memory model. The size is determined by the number of internal nodes and number of terminal nodes in the trie. A spell checker only optionally contains a tokenizer. If a tokenizer is provided, the set of tokens found in the training corpus is stored and used to control search. This only slightly slows down training, but does require the space to store the tokens, which is usually small compared to the space required to store the language model. The other component stored during training is the set of tokens along with their counts. The counts are stored as an instance of util.ObjectToCounterMap, which is available through the method TrainSpellChecker.tokenCounter(). The set of tokens may be pruned back to only include ones with counts above a specified threshold through the method TrainSpellChecker.pruneTokens(int). The compiled model only stores the set of tokens as a simple array of strings. The set of tokens is converted into a character-level trie structure that is used to control search. In LingPipe's encoding, a Java object is stored for every prefix in the set of tokens along with the character used to get there. Thus the runtime size of a model may be larger than on disk if there is a non-empty token set. Search for corrections is carried out from left-to-right. At each point, a partial hypothesis is expanded with every character which could follow the partial hypothesis and lead to one of the known tokens (the user input is always allowed as an output hypothesis). Thus the branching factor controls the amount of time required to search for spelling corrections. The effect of pruning the set of tokens may help or hurt accuracy, but it usually has little effect with low pruning thresholds and an increasingly negative effect on recall (finding corrections for ill-formed input) as the number of known tokens decreases. The spell checker is case sensitive. If you need a non-case-sensitive spell checker, then the tokenizer factory is the right place to implement case normalization. You will need to provide a compilable tokenizer factory that handles case normalization. The alternative is to make sure all the training data is case normalized before being sent to the trainer and also before being sent to the spell checker. If this happens in the tokenizer factory, there is no way for the two to get out of synch. If you are training without tokenization, then normalization must be handled externally. In addition to case sensitivity, the spell checker is sensitive to the particular unicode form of characters. If there are a wide range of formats used for characters (e.g. Latin1 mixed with separate diacritics and characters or mixed with half-width CJK versions), a package like the International Components for Unicode should be used for normalization. ICU is also the best package available for generic case normalization, which they call "case folding". The remaining parameters only apply to the compiled spell checker, and thus are all defined as methods in the class spell.CompiledSpellChecker. There are five methods which control which edit operations are allowed: setAllowDelete(boolean), setAllowInsert(boolean), setAllowMatch(boolean), setAllowSubstitute(boolean), and setAllowTranspose(boolean). For instance, calling setAllowDelete(true) allows characters to be deleted in edits. Allowing all edits almost always leads to more accurate decoders. Turning off edit types is always faster. The most expensive edit by far are insert and substitute; delete, match and transpose are all bounded by the input string. In some special applications, such as using spelling correctors for Chinese tokenization or case correction, only certain edits will be allowed in the model. For instance, only insert and match for Chinese tokenization and only substitute and match for case correction. Insertion is the most expensive operation, because it may apply consecutively without bound as long as it is extending a known token (or any time at all if there are no tokens). Thus there is a method setNumConsecutiveInsertionsAllowed(int) which controls how many insertions are allowed in a row. Set this to 1, its default value, if at all possible. This will usually help with both accuracy and has a huge impact on speed. The n-best size restricts how many potential edits are considered at once. The smaller the n-best size, the faster the decoder. The problem is with a small n-best size, the hypothesis that will eventually be the best may fall off the search space; this is known as a search error. Typically, n-best size will be tuned to the lowest value that does not lead to performance degradation through search errors. If the spell checker is used to provide n-best results, the n-best size should be set significantly higher than the number of n-best results desired. This will prevent any of the top n final hypotheses falling off the queue of hypotheses too early, essentially preventing n-best search errors. A set of tokens may be provided through the method setDoNotEditTokens(Set<String>). If these tokens are seen in the input, they will not be considered for edits. This can have a huge impact on run time. The larger this set is, the faster the decoder will run. As with other parameters, donfigure the set of do-not-edit tokens to be as large as possible. Usually this is done by taking the object to counter map from the compiled spell checker and saving tokens with high counts. Unfortunately, there is not a direct way to save this set of do-not-edit tokens as part of the model because it would've broken backward compatibility on model format. Short tokens wreak havoc with both the language models and the search space. That's because strings like "of the" are so popular in text relative to the number of times they are misspelled. The method setMinimumTokenLengthToCorrect(int) sets the minimum token length in the input that is considered for correction. We have found that for English, setting this to 3 is a workable value. Users rarely misspell words shorter than this. In practice, users make fewer errors on the first and second characters in words than in the middles or ends of words. This is not reflected in the weighted edit distance directly, so we allow it to be set programatically in the decoder. The methods setFirstCharEditCost(double) and setSecondCharEditCost(double) provide additional costs to edits of the first or second character in a user's input token. Note that high first- and second-character edit costs make it less likely that short strings will be edited. We have found values of -2.0 for the first character and -1.0 for the second character to be good initial values for English. Often the language models will want to edit tokens that are known, because the resulting string is much more likely. In practice, if users spell tokens correctly, it is much less likely they are errors. This corrects for a bias in queries toward rarer known words that is not in line with the underlying character language model. The method setKnownTokenEditCost(double) may be used to provide an additional penalty for editing a known token. We have found values of -2.0 or -3.0 to be good initial values for English. In this section, we provide examples of how to evaluate spelling correction. Evaluation is based on a human-annotated reference file matching queries with their corrected versions. We've included a spell-checker trainer based on the hockey data in the directory $LINGPIPE/demos/data/rec.sports.hockey/train that not only compiles the model to a file, but also saves the token counter to a file. The training code may be found in the file src/TrainSpell.java. Because it is so similar to the earlier code, we only comment on how the models are constructed and written to file. We're big believers in test-driven development for natural language processing. Just as in other kinds of programming, designing test sets by hand plays a key role in understanding the problem being computed. That's why our first question to prospective customers is always: "do you have examples of the kind of things you'd like to compute?". To evaluate a spell checker, we need some indication of what the expected results are. For this demo, we define a simple file-based format allowing defining the truth. Typically, the queries being evaluated for spell checking will be derived from an actual query log. The format is set up to allow the original lines from the query log to be maintained. The format is based on line-triplets with prefixes indicating function. The opening line of a triplet begins with D: and simply repeats the raw query log information. This is often helpful for purposes external to this evaluation. We carry these lines along for display, but they have no other role. The next two lines are marked with O: and C: for original and corrected query. Note that if the original query was correct, the correct form should be identical. Also note that spelling correction is case sensitive, so the data in the gold-standard reference file is also case sensitive. For the purposes of this demo, we assume the queries do not have line breaks and that the characters are encoded in Latin1 (ISO-8859-1). The evaluation of the trained hockey spelling corrector against the demo evaluation data file is done through another preconfigured ant target, evalSimple. The output looks very much like the input with further annotations. For each annotation entry the EvaluateSpell class runs the original query from the O: line in the reference file against the didYouMean() method of the spell checker. The C: line is also from the reference file, and represents the intended correction. The S: line contains the string returned by the didYouMean() method. The system is correct when the system answer matches the correct result. The token counts in the training data for each token in the training data is displayed in parentheses. For instance, Wayne appeared 39 times in the data and wayne only 4 times. The tokens that appear zero times are special in that they are considered unknown tokens. Unknown tokens have less of a penalty to edit, but can not be the output of editing when spell checkers are configured to be token sensitive. In addition, each of the O:, C: and S: lines has the log2Estmate() appended from the underlying language model in the CompiledSpellChecker. This score is very important for tuning as will become evident. The idea is to compute an overall utility for the spell checker. The scoring parameters will depend on the business use case. The above scoring system represents a reward of 1 in the case of the system properly correcting a user error, a penalty of -1 for suggesting the wrong correction, a penalty of -2 for not making any suggestion at all when there is a user error, and a penalty of -1.5 when the the user was correct and the system proposed an erroneous correction. The motivation for this particular scoring is that the worst kind of error is one where the user query is an error, but the system makes no suggestion, because this is the case where the user will never find the right answer. If we provide a correction for a correct user input, at least they see the correct results for search initially. After creating labeled evaluation data, various system paramters may be tested for their performance. Typically, we start with reasonable defaults (which will be much larger penalties for edits when we get to realistic size data), and then tune the parameters one at a time in an attempt to improve the system. It's very easy to tune posterior weights, like edit distances. It's harder to tune the underlying language model, as it must be recompiled. It's possible to serialize a large language model and then prune it to evaluate, though we do not provide code to do that as part of this tutorial. It's important to realize that when tuning on a reference collection, it has the role of development data. It's tempting to highly optimize scores on development data, but it's dangerous due to the likelihood of overfitting the data. A statistically sound evaluation would have you set aside two labeled reference data sets. One would be used for development, that is, to tune the parameters. The second would then be used to report final test results. This is a much more sound estimate of future performance than testing on a single development set. LingPipe provides an alternative to spelling checking that finds the most likely completion among a set of fixed phrases for the text entered so far by a user. Note that the application is performing spelling checking at the same time as completion. For instance, the top suggestion is "amazon", even though the query so far is "anaz". This is not surprising given the number of results reported for the phrases starting with "anaz" is so small. Next note that it's not doing word suggestion, but phrase suggestion. Some of the results like "anazao salon" are two words. One important difference between the auto-completion and spell checking is that auto-completion typically operates over a fixed set of phrases. What this means is that if I type a query <I want to find anaz>, there are no suggested completions. The source of phrases for a web search is typically high frequency queries from the query logs. In Google's case, they don't return suggestions in order of number of results; if they did, anazapta would occur above anazao, since they both match exactly on the prefix. The spaces are just spaces. We've just used state populations (estimated in the middle of 2006), which may or may not be a good proxy for search popularity. It's a reasonable proxy if you are asking people randomly selected from the U.S. population to list their home state. But if you're selecting a travel destination, Hawaii and the District of Columbia are much more popular than their populations would suggest. In general, the counts are going to be used to balance which results are most popular, and should reflect the results likely to be desired by users. The results report the queries (between vertical bars so the spaces are clear) followed by up to five auto-complete suggestions. The scores consist of log (base 2) numbers scaled as probabilities like for spelling (more on that below). Note that we get auto-complete suggestions from non-matching prefixes, as in the query <New> getting the auto-complete suggestion "Nevada". It's configured to only suggest three completions per input. As explained in the javadoc for spell.AutoCompleter, the auto-completer finds the best scoring phrases for a given prefix. The score of a phrase versus a prefix is the sum of the score of the phrase and the maximum score of the prefix against any prefix of the phrase. The score for a phrase is just its log (base 2) maximum likelihood probability estimate; that is, the log of its count divided by the sum of all counts. The score for matching "Mew Y" against "New York" requires a substitution of the initial 'M' for 'N'. Scores are computed by weighted edit distance, just as for spelling. Configuring auto-completion is very much like configuring spelling, only with a fixed list of phrases and counts supplied to the constructor along with search parameters and a weighted edit distance. We'll walk through the command-line demo, all of the code for which is in the main() method in the file src/AutoCompleteCommand.java. Note the use of the FileLineReader.readLinesArray() method, which ireads the lines from a file into an array using a specified character encoding. The code in the loop just parses the lines apart based on the last space and adds them to the map. In addition to the phrase counter (in general, a map from strings to numbers) and edit distance, the configuration specifies the maximum number of results to return, the maximum search queue size, and the minimum score of returned results (phrases with match scores below the minimum will be discarded rather than displayed). Finally, we walk through the arguments and compute the auto-completions. There are really only three parameters for tuning auto-completion, the edit distance, and the search parameters. The edit distance is tuned in exactly the same way as it is for spelling. The maximum number of results to return is more of an application decision than a tuning decision. Having said that, smaller result sets are faster to compute. The maximum queue size indicates how big the set of hypotheses can get inside the auto-completer before being pruned. To tune, this should be set as low as possible without causing search errors. Kukich, Karen. 1992. Techniques for automatically correcting words in text. ACM Computing Surveys 24(4):377-437. Jurafsky, Dan and James H. Martin. 2000. Speech and Language Processing. Prentice-Hall. Chapter 5. Textbook treatment of noisy channel models. Shannon, Claude. 1949. Communication in the presence of noise. Proceedings of the IRE. 37(1):10-21. The original noisy channel decoding paper. Peter Norvig. 2007. How to Write a Spelling Corrector. On http://norvig.com. Very nice summary with straightforward Python demo code. Here are a few other alternatives, both explained by Tom White. Tom White. Did You Mean: Lucene?. Java.net. Tom White. Can't beat Jazzy. IBM Developerworks. Lucian Vlad Lita et al. 2003. tRuEcasIng. In Proc. ACL. For accent restoration, David Yarowsky describes a classifier-based approach for Spanish and French (ironically, wrongly cased in the IBM bibliography due to human error with BibTeX). David Yarowsky. 1994. Decision lists for ambiguity resolution: Application to accent restoration in Spanish and French. In Proc. ACL.